Good morning! 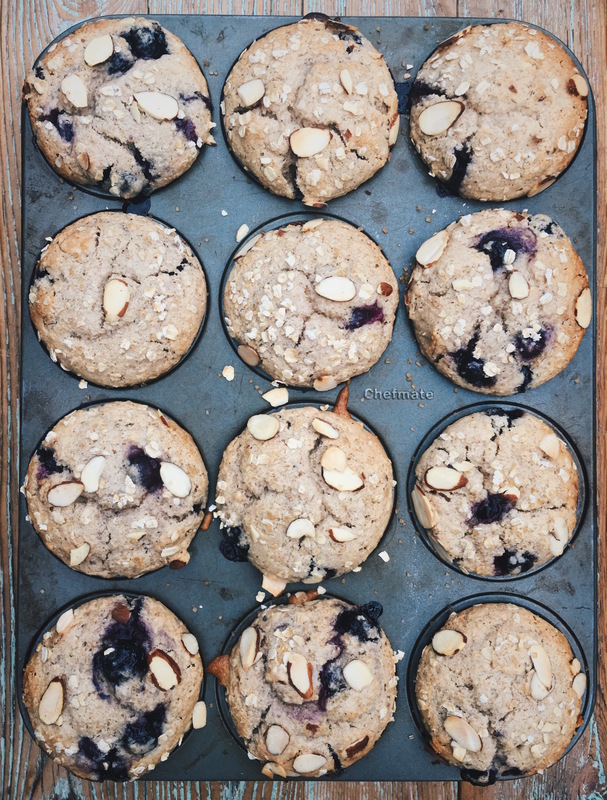 These are my Blueberry Almond Butter Protein Muffins. They are a perfect on-the-go breakfast because they are low-gluten, high protein from the almond butter, and just perfectly sweetened. I love when things turn out right, ya know? Vegan AND delicious AND fluffy? I literally can’t even. Preheat oven to 375 and line your muffin tin (makes 12). In a large stainless steal bowl, combine almond butter, “eggs”, ACV, sugar, salt, coconut milk and oil. Heat the contents over low heat on your stovetop— this melts the almond butter a little bit making the wet ingredients easier to incorporate into the dry ingredients. Then, using 10 strokes with a whisk, whisk in the flours and baking powder. Remove whisk and use 10 strokes with a big spoon to fold in the bloobz and slivered almonds. Careful not to over-work the batter! Spoon the batter into your liners all the way to the top. Sprinkle on the toppings. Bake for 25 minutes and let cool completely.